The lymphatic drainage of the upper limb follows the unnamed lymph vessels, which starts in the hand and run upwards in the direction of the axilla. When they reach cubital fossa, the lymph goes through cubital nodes. From here, lymph vessels run superiorly to drain into the axillary lymph nodes. The lymph vessels draining the lymph from the upper limb, as elsewhere in the body, are split into 2 groups: superficial and deep. The superficial lymph vessels are in the subcutaneous tissue. They’re far more numerous in relation to the deep lymph vessels. They usually accompany the superficial veins. The superficial lymph vessels drain the lymph from skin and subcutaneous tissue. They course upwards in the direction of the axilla. Most of them end in the axillary lymph nodes. Those from lateral side of the limb and lateral 2 digits follow the cephalic vein and drain into the infraclavicular lymph nodes. Those from medial side of the limb and medial 3 digits follow the basilic vein and drain into the lateral group of axillary nodes. A number of the medial lymph vessels terminate in the supratrochlear or epitrochlear nodes, that are situated just above the medial epicondyle along the basilic vein. A couple of lymph vessels drain the thumb end in the deltopectoral lymph nodes. The efferents from these nodes pierce the clavipectoral fascia to drain in the apical group of axillary nodes. Just about all the superficial lymph vessels of the upper limb drain into lateral group of axillary nodes. Lymph from palm is drained into the lymph plexus on the dorsum of the hand. 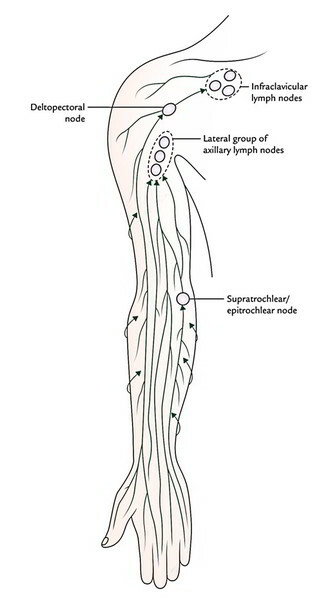 Vertical area of lymph shed is in the middle of the back of arm and forearm: The lymph vessels from the back of the arm and forearm curve around the medial and lateral borders of limb to make it to the front of the limb, thus creating a vertical area of lymph shed. The deep lymph vessels are much less numerous in relation to the superficial lymph vessels. They drain structures being located deep to deep fascia, viz muscles. The deep lymph vessels course along the arteries and drain into the lateral group of the axillary lymph nodes. Lymphangitis: The inflammation of the lymph vessels is referred to as lymphangitis. It generally follows trivial injuries, example, cuts and pin-pricks, to any part of the upper limb. In acute lymphangitis, the lymph vessels could be observed underneath the skin as red streaks, that are tender (i.e., painful to touch). Lymphedema: The obstruction of lymph vessels may cause edema (i.e., swelling) in the area of drainage because of accumulation of tissue fluid. The lymph nodes draining the upper limb are split into 2 groups: (a) superficial and (b) deep. Infraclavicular nodes, 1 or 2 in number, are located on the clavipectoral fascia along the cephalic vein. They drain lymph from thumb consisting of its web and upper part of the breast. Deltopectoral nodes, are located in the deltopectoral groove along the cephalic vein just before it pierces the deep fascia. It’s thought to be displaced infraclavicular node. It drains the lymph from the breast and adjoining small structures. Superficial cubital/supratrochlear nodes are located 5 cm above the medial epicondyle along the basilic vein. They drain the lymph from the ulnar side of the hand and forearm. Axillary lymph nodes are existing in the axilla and are split into 4 sets. These are main lymph nodes of the upper limb. Along the medial side of the brachial artery. In the cubital fossa, in the bifurcation of the brachial artery (named deep cubital node). Occasionally along the arteries of the forearm. The axillary lymph nodes are enlarged (lymphadenopathy) and become painful following infection in almost any part of the upper limb. In infection affecting the medial side of the hand and forearm, supratrochlear lymph node becomes enlarged and tender.